Most of us know storytelling is a vital source of truth in public as well as in personal life, but many people dislike others saying and writing so. Too often, storytelling is presented in a weird and whacky way, or by people who for some reason seem unqualified. This devalues the proposition. Earlier this year I researched, wrote and presented an academic paper to a peer-reviewed conference on the usefulness of storytelling in public life. I wanted to cut away myth, identify experts and get down to what we know for sure. I’m NOT presenting that in detail here. I offer the following points (in true interweb fashion) without any attribution whatsoever. I do this because these are the claims I see as being self-evidentially true. See what you think. People enjoy stories because they are part of what makes us human. We voluntarily give up our own time, stand in queues and pay money to read, hear and watch — to be immersed — in a sustained, pleasurable story (e.g. a movie or play). In every generation stories are personally, socially and culturally natural and acceptable. Stories are so desirable and memorable, good ones transcend their original means of distribution. Stories transmit emotion, complex ideas and meaning, so are a significant part of how we interpret and connect with ourselves, each other and the world. A story can carry a heavy cargo from one mind into others. A story may seem trivial, yet be far from superficial. Leaders, professionals and innovators use stories to influence people. From Plato (even though he distrusted art) to Jesus to Marx, from Homer to Bunyan to Chekhov, from Shakespeare to Lincoln to Spielberg. From Edison to Churchill to Buffet. Stories are a peak and perfection of communication. Stories give license to say or mention anything you can think of, and often to do so in ways we could not or would not normally. Stories can be fictional, and true, at the same time on several levels. Stories have fun with words, jargon-free, so are highly inclusive. Everyone (mostly) gets it. No-one is excluded by a lack of knowledge. Producing culture confers credibility on its creators. Commissioning and creating stories of lasting value are genuine, generous acts of innovation. Stories remove the taint of narcissism from marketing. 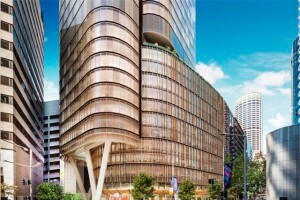 200 George Street’s wood and glass facade. The building will become EY and Mirvac’s new Sydney headquarters. 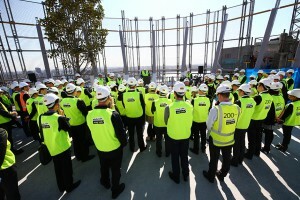 If you live or work in Sydney’s CBD, you may have noticed an impressive new office tower going up at 200 George Street. While the building is innovative, the site itself is historically rich and significant to New South Wales. Late last year I received a commission from Mirvac to write a series of short historical fictions, starting with the site’s early-colonial history. That history includes the beginnings of European settlement at Sydney Cove (aka Warrane), our nation’s biggest ever bank robbery (in comparative terms), convicts, entrepreneurs, Rum Rebellion connections, Australia’s newspaper origins, fires and deaths, opium and gambling dens and race riots. My stories are now in final draft stages and will be made available on-site, in readable and audio formats in due course, as part of the building’s heritage commitments. There’s a lot more I’d like to tell you about this creative project, but for now, I’ll wish you well until next time. 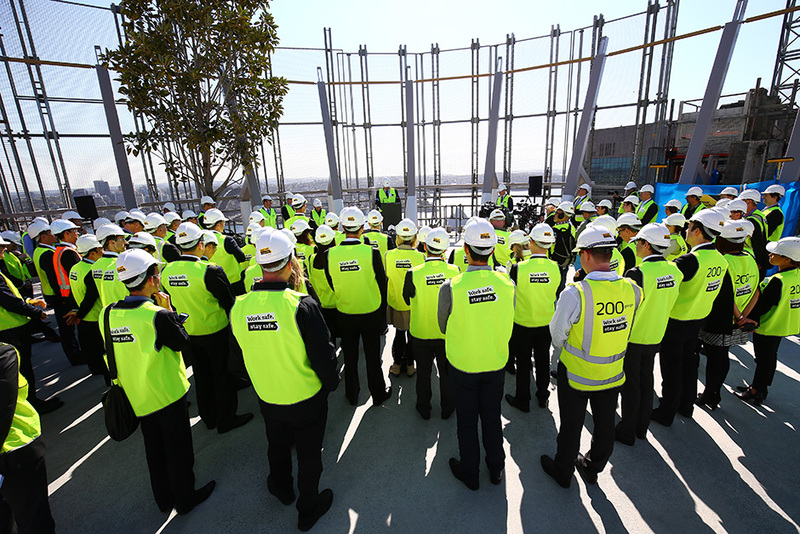 The topping-off ceremony held earlier this month, celebrating completion of the main structural works for 200 George Street, Sydney. There is power in preparing. Three millennia later, we still do not perform at our best without contextual preparation. Today, news travels so fast, preparation can be urgent and important. Most people seem to understand this, but it’s easy to under- and over-estimate the needed effort. At a minimum, preparation is thinking first. About audience, occasion and aim. The next level puts it in writing. For brief engagements, a few jotted points, in your own shorthand. Not a script. Structured for memorability and clarity. After drafting comes compressing and self-editing to clarify and confirm claims, facts, sources. And what about predicting predictable questions, with appropriate responses? Many still use the Five Canons of Rhetoric – invention, arrangement, style, memory and delivery – as a preparation template. There are also others. And we haven’t even touched room management, visuals or event management. Many people would like to perform well, but only some put in the necessary preparation. Preparing well is akin to being ready. Effective preparation and practice are useful, learned, contextual skills. Practice improves practice. Experience can lessen its demands, but not its value. Some people like to do it often. Others prefer annual check-ups. Regardless, a personal or corporate metaphysical is sometimes the only way to personal, relationship and group progress. 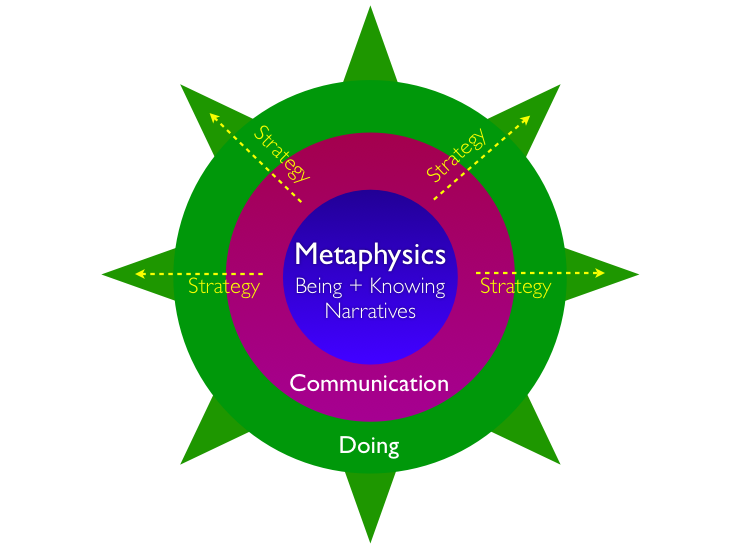 Put simply, metaphysics relates to being and knowing. It’s reviewing beliefs, identity, ideals, desires and sense of meaning. In corporate settings, it’s understanding purpose, values, direction and vision, not what the website says, but what really is. Metaphysics is more than facts and opinions. It coalesces into narratives inside us, casting ourselves and others in roles we play. Changing scripts can be hard and take time. Strategy and planning are not metaphysical per se, though they flow deeply from metaphysical rumination. Apple seems a curious case in point. I used to know their vision and values and why I wanted their products. Today, I’m less sure. Their 38% gross margin goal shouts loudly. And Virgin Galactic’s recent accident raises big metaphysical questions for its management. Their answers will affect public support and that company’s future. In the graphic below, put what you like in the outer layers; what’s key is in the core: in the metaphysics. When you get metaphysical, remember what Dwight Eisenhower apparently said: “Plans are nothing. Planning is everything.” Enjoy the journey, the discussion and the process. Let me know if you’d like more info about a Personal or Corporate Metaphysical. Thanks for reading and best wishes until next time. Handling hostile audiences isn’t easy, but is sometimes necessary. Facing hostile audiences is fraught with risk, but sometimes a person of position has to front up. Effective handling probably won’t win everyone, but it will win some and moderate others. Beware advice from the Internet. One webpage advises telling jokes to lighten a heavy atmosphere. Another says confront hecklers toe-to-toe. Really? Maybe in standup comedy. Don’t over-formalise: stiffness distances people rather than breaking down barriers. How we set up a room as well as how we dress, sit, stand and speak influences audience response. Let personality and warmth infuse or at least peek through professionalism. Emotionalism hinders, but ignoring emotion is unhealthy and unhelpful. Communication is about process and timing as much as content. Nut out a simple plan that lets your meeting blend spontaneity and flexibility with purpose, including: a) your meeting aim, b) your key content points and shorthand for any critical detail, c) a rough process or timing and order, and d) action outcomes. Allow some discursive conversation. It’s essential for relationship. Too often “I can’t help you” or “There’s nothing more I can do” is an excuse. Even if we can’t concede something substantive for policy, resource or other good reasons, we can try to concede something. People who feel powerless or disrespected get angrier. Be creative. Maybe offer to make a phone call, write a note, follow up, or put in a good word. Show care by trying to understand and lighten people’s loads, even when we don’t agree. Mastery researcher K. Anders Ericsson says skill grows through deliberate practice outside our comfort zones with correct feedback. Don’t leave hostile meetings to chance. Simulation builds experience that fuels your brain when you need to think on your feet. P.S. If you’re interested in activism tactics, you may be interested in my post about Saul D. Alinsky’s Rules For Radicals, also on this site. If accuracy matters in communication, using the right word is smart. On the weekend I heard a guy speak, who travels the world with an important message. He’s a smart guy, a PhD, but he used the word travesty when it seemed certain he meant tragedy. Several times it sounded like he used the word tenant, when the word tenet was what he meant. Someone will say to me, “Antoni, get over it. You know what he meant,” which is fair advice and true; but it doesn’t change the fact that some of us will think slightly less of a person’s skill, character or judgment if they continue using the wrong words. The wrong word miscommunicates and possibly rankles. If you’re going to use a word in public, please: 1. use the right word and 2. say or spell it correctly. If you’re unsure, look it up. If you’re still unsure, use another, safer word. Even if it’s pedestrian. American author John Gardner said that writers (and I say by extension, speakers) ought to be like circus knife throwers: experts in an exact art. Missing ought not be an option. Using the right word, in the right way, may not be as great as using the best word, but it’s a lot better than using the wrong word, or using the right word wrongly. Yes, many words are confusing. That’s why Paul Brians put together this excellent and helpful webpage. Now that’s off my chest, I’m back to work.